An 82–year-old man, Ishwar Dutt, was brutally killed in his shop by unidentified assailants yesterday. The body was found by his younger son this morning. Former Haryana minister and senior Congress leader, Prof Chhattarpal Singh, has alleged that thousands of voters in his constituency were denied the chance to vote during the polling held on February 3. The Haryana Government is contemplating massive reforms in the educational curriculum by introducing gradation and continuous comprehensive evaluation system. 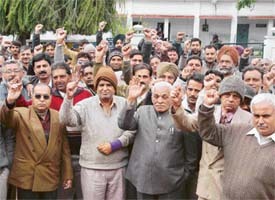 Several social and employees’ associations staged protest demonstrations and submitted memorandums in favour of their demands to the officials concerned here today. A Police Control Room (PCR) vehicle hit two schoolgirls near Mahaveer Park in Ambala City this evening. People gathered at the accident spot and manhandled the driver of the police vehicle. Naik Jagat Narayan, who had fired at a labourer leading to his death, was handed over to the police by the Army authorities here this afternoon. The soldier had shot the labourer, Shravan Kumar, at a unit located in Ambala Cantonment. The Army yesterday clarified that the firing was an accident. The body of a youth, who was allegedly abducted from Delhi, was recovered from the fields of Morkheri village, Rohtak, yesterday night. Jai Om was abducted about a week ago from Dhansa in Delhi. The VHP has decided not to allow the Pakistan cricket team to play matches in other parts of the country if it refused to play a match at Ahmedabad in Gujarat. This was dated by Mr Rampal Gaur, President, Haryana unit of the VHP, while addressing party workers here last night. Sixth annual state-level electronic science convention was held at SD College, Ambala Cantonment today. The electronic science convention was organised by the Department of the Electronic Science SD College in collaboration with Electronic Science Teachers Association and Department of Electronic Science, Kurukshetra University. Electronics goods worth several lakhs were stolen from a video mixing shop at Gohana town, about 35 km from here, last night. According to a report, the stolen goods included computers, two colour TV sets, a video mixing machine, VCD, VCR. According to another report, thieves are reported to have broken the locks of a kiryana shop and decamped with Rs 3,000. A student, Tariq, who had disappeared from his house on Thursday last, returned to his home at Kharkhauda town, 19 km from here, on Monday. The parents of the student had lodged a complaint with the police against two youths suspecting that they had kidnapped him. An 82–year-old man, Ishwar Dutt, was brutally killed in his shop by unidentified assailants yesterday. The body was found by his younger son this morning. 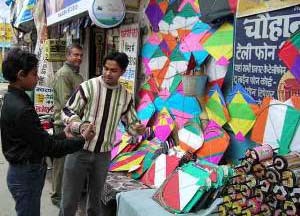 The police suspects the involvement of the notorious Bawaria gang which might have entered the shop to commit a theft. The adjacent furniture shop was also burgled. Ishwar Dutt was father of the District Congress President, Mr Raj Kumar Tyagi. Dutt was hit several times on head by a wooden baton, which was found lying near the body. Mr Tyagi has not raised his finger towards anybody as the family had no ‘known’ enemies. Mr Tyagi had resigned from his post after being denied a ticket form the Yamunanagar Assembly seat and had filed his nomination papers as an Independent candidate. However, he had withdrawn his candidature after being persuaded by senior Congress leaders. Mr Pawan Tyagi, younger son of Ishwar Dutt, found the body lying on the blood-smeared bed when he reached the shop to give the morning tea to his father. The blood was splattered all over the bed, floor and even on walls. From the body’s position (with quilt over the body and head on a pillow) it seems that attackers did not even give a chance to Ishwar Dutt to even turn his head. Though Ishwar Dutt’s house is nearby he used to sleep in the provision store ever since it was set up. Last night he had left for the shop at 10.30 pm. Senior police officials, including the SP and two DSPs, reached the spot. It is suspected that burglars entered Dutt’s shop through the rear door after committing theft in the furniture shop. However, burglars did not find anything worth their interest in Dutt’s shop. They had stolen Rs 5,000 from the furniture shop. According to the SP, Mr Rajinder Singh, the circumstantial evidence points toward the involvement of the Bawaria gang. The gang is notorious for attacking any person they come across while committing the theft. The dog squad failed to provide any clue as it had rained the entire night. A case under Section 460 of the IPC has been registered. Addressing Press conference here today, the former minister said he had brought the matter to the notice of the Duty Magistrate and the Election Commission Observer, but to no avail. “This is a political move sponsored by the Chautala regime and aimed at causing loss to the Congress candidates,” he asserted. Prof Chhattarpal, who contested for the Ghirai Assembly seat in the district, alleged that at least 4,000 genuine voters of his constituency were not allowed to vote as “their names had been struck off the voters’ list by the Returning Officer.” On being asked about the party’s stance on the issue, the Congress leader maintained that they would seek legal opinion in this regard as this “political mischief” could have been committed in other Assembly segments as well. “My political rivals may not be able to harm my poll prospects by this move, but seen in a large perspective, this is a serious matter. By adopting such means, any regime can reverse the people’s mandate, especially when the difference between the votes polled by the contestants is low,” he remarked. On being questioned about the allegations of nepotism in the allocation of the Congress ticket, Prof Chhattarpal admitted that it had sent a wrong signal among the masses. He, however, added that the image of the party leaders involved — and not of the party itself — would be tarnished by this episode. Lashing out at Mr Chautala, the former minister alleged that on seeing the imminent defeat of the INLD nominee from the Ghirai constituency, the Chief Minister asked his party men to vote in favour of an Independent candidate. In response to another question, Prof Chhattarpal revealed that certain Congress members had worked against him during the poll campaign. “They did not stop their anti-party activities even after getting notices from the state leadership. Anyhow, they have been told to explain their stance within a stipulated period,” he stated. The Haryana Government is contemplating massive reforms in the educational curriculum by introducing gradation and continuous comprehensive evaluation system. According to the Secretary, Board of School Education, Haryana, Mr Rakesh Gupta, introduction of the proposed reforms of gradation and continuous comprehensive evaluation system was a big task. Mr Gupta,who was here to take stock of the arrangements with regard the board examinations commencing from February 16, said the first step was to establish the credibility of the institutional framework of the state in connection with education system. To this effect the focus in the past two years had been to stop copying in examinations. With substantial success achieved on this front the board's slogan now is for reform in the "Education-Examination". Dwelling on the arrangements for the Board examinations getting underway from February 16, he said that 4,86,409 candidates would appear in the middle examination for which 1668 centres had been created. For effective inspection of these centres, there would be 175 sectors in the entire state and each sector would be under the charge of a district officer. Elaborate security arrangements have been made to prevent outside interference at the examination centres. The board would set up 470 flying squads out of which 80 would comprise of retired Army officers and board officers known as the "Rapid Action Force" and "Special Task Force". They would operate from board headquarters. The board will also set up five Control Rooms at different district headquarters. The board has identified 169 examination centres as sensitive in the state. Also, to facilitate such eligible private candidates whose admit cards have been misplaced, provision has been made for the downloading of admit cards from the website of the board. Mr Gupta said that on account of anti-copying measures taken by the board there had been an overall stress on quality education in the schools. It is on account of this that there has been an increase of 85,000 examinees at the middle level this year. On the other hand there has been a decrease of 36,000 in the number of examinees taking standard X exam. Hundreds of members of the city committee of the Mool Pravah Akhil Bharat Nepali Ekta Samaj staged a protest march, demanding restoration of democracy in Nepal. The Samaj body urged the intellectuals and mediapersons to make efforts for building up international pressure on the Nepal King for withdrawing the royal diktat declaring emergency in Nepal. Meanwhile, members of various employees’ organisations staged a demonstration in protest against raising the limit of foreign investment in the telecommunication sector to 74 per cent. The trade unionists remarked that this move of the UPA government at the Centre was not only anti-employee but also anti-national. Members of the Hisar and Bhiwani units of the Forest Department Labourers Union also staged a dharna at the mini-secretariat here. The protesters demanded the immediate release of the amount of Rs 32 lakh sanctioned for payment of dues to them. They also submitted a memorandum to the Deputy Commissioner in this regard. A Police Control Room (PCR) vehicle hit two schoolgirls near Mahaveer Park in Ambala City this evening. People gathered at the accident spot and manhandled the driver of the police vehicle. The girls sustained injuries in the incident and were admitted to Civil Hospital, Ambala City. Superintendent of Police, Ambala, Mr M.R. Kiran said they were looking into the facts of the case. “Medical tests will be carried out to ascertain whether the driver was drunk. Departmental action will be taken against the erring police personnel,” he said. The incident took place at about 5 pm when the police vehicle was coming from the Vijay Cinema side. It then collided with the cycles which the girls were riding. The girls, Reena and Sonia, both residents of Ranjeet Nagar, were going home from their school. Both of them are Class XII students in PKR Jain School. While Reena has a fracture in her right leg, Sonia has sustained injuries on both legs. As soon as the incident took place, local people gathered at the spot. They started thrashing the driver as they alleged he was drunk. Two other police personnel who were aboard the vehicle ran away from the spot. The crowd then deflated the tyres of the vehicle. When the police reached the spot, people were in an agitated mood. They demanded prompt action must be taken against all the guilty police personnel. The police had to resort to a mild lathi charge to clear the irate crowd. Reena said although she did see the police vehicle coming towards them, she did not realise that it would hit them. “It suddenly rammed into us. I and Sonia fell down due to the collision,” she said. Sonia said she sustained injuries on both her legs. “Right now, both my legs are paining. I do not know the extent of injury to my legs,” she said. Meanwhile, MES contractors today held a dharna to press for their demands linked to the firing incident. They held the dharna outside the GE North office located near Kali Paltan bridge. One of their demands included handing over the soldier to the local police, which was met in the afternoon. The contractors also demanded the authorities concerned to suitably compensate the next of kin of the labourer and take steps to prevent such incidents from happening in the future. Chairman of the MES Builders Association of India, Haryana branch, L.C. Gupta and secretary Rajesh Jain said they had been informed that the authorities concerned would take a final decision tomorrow with regard to their demand of compensation to the family members of the deceased. Earlier, the Delhi police had arrested one of his abductors. Working on tip-off provided by the arrested abductor, Sher Singh, Jai Om’s body was recovered from the fields of this village. Another unidentified body was found lying in the adjacent fields by villagers after the Delhi police left the village. The Sampla police today sent a message in this regard to its counterpart in Delhi. He said the VHP did not oppose the matches being played by the Pakistan team in India for upholding country’s respect. It Pakistan’s feel threatened they should not play with the Indian cricket team. He blamed the security agencies of Pakistan for preventing the Pakistani players from playing in Ahmedabad. Mr Gaur urged the Government of India to not to allow the Pakistan team in the country if it refused to play in Ahmedabad. He also asked the Pakistan team to cancel their visit. The VHP leader also opposed the reservation of Muslims in para-military forces. Twenty five colleges from all over Haryana participated in the convention and 171 entries were received and 262 students participated in the competition. Mr Gokul Singh, Chief General Manager Telecom, inaugurated the morning session of the convention. Mr Gokul Singh highlighted the importance of Electronics and Telecommunication. Vice-Chancellor Kurukshetra University Dr A.K. Chawla who was the chief guest said that widespread networking of computers has turned the world into a global village. He felt that extra ordinary efforts were needed to start revolution in electronic sector in India. Dr Chawla gave away prizes to the winners. The Chattopadhaya trophy for project section was awarded to MLN College, Yamuna Nagar. 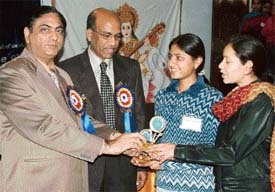 Overall running trophy was also won by MLN College, Yamuna Nagar. In working model project, MLN College, Yamuna Nagar was first, RKSD College Kaithal was second, MLN College, Yamuna Nagar was third while consolation prizes went to DAV College, Ambala City and GN Khalsa College, Yamuna Nagar. In demonstration model project, MLN College, Yamuna Nagar was first, MLN College, Yamuna Nagar was second, SD College, Ambala Cantonment was third while RKSD College, Kaithal won the consolation prize. In On the spot software development, Maharaja Agrasen College, Jagadhari was first, SD College, Ambala Cantonment was second, DN MahilaCollege, Kurukshetra was third while GN Khalsa College, Yamuna Nagar got the consolation prize. In quiz, MLN College, Yamuna Nagar was first, Vaish PG College, Bhiwani was second, DAV College Ambala City was third and Government College, Kalka got the consolation prize. In On the spot logical circuit design, SD College, Ambala Cantonment and MLN College, Yamuna Nagar were first, MLN College, Yamuna Nagar was second, SA Jain College, Ambala City was third while Government College, Karnal got the consolation prize. In Power point presentation, MDSD College, Ambala City was first, GMN College, Ambala Cantt was second, SD College, Ambala Cantonment was third while MM Engineering College, Mullana got the consolation prize. and MDSD College, Ambala City. In Essay writing, Dyal Singh College, Karnal was first, MDSD College, Ambala City was second, MLN College, Yamuna Nagar was third while consolation prizes went to RKSD College, Kaithal, DAV College, Ambala City and DN College, Hisar.